Home » Mission Statement » Blog » Why dental implants are the right option for you. Why dental implants are the right option for you. Dental Implants are simply described as little artificial ports that are inserted into the jaw bone to hold up a false tooth or incase of multiple missing teeth. The implants can be spaced apart appropriately to hold up a set of teeth grouped together, which we also refer to as a bridge. 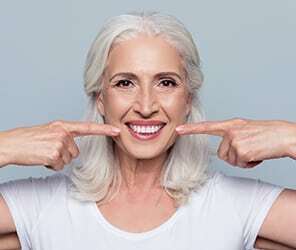 The use of dental implants in rehabilitation of patients who have lost all their teeth has been linked to an increased quality of life, ability to eat well, speak better, confidence, and overall feeling of wellness. For an implant to be considered, you have to first have the bone structure and density available to put the implant post into. Sometimes long-lost teeth have led to the loss of bone in the area. This warrants regeneration of the bone first before the implant can be placed, or often the regenerative exercise can be coupled with the placement of the implant. Decision on which approach, where to get the bone from, what kind of bine etc. is best determined after a proper assessment is made using a guide stent and 3D x-ray. Once you have gone past the consultation stage and are considering the implant therapy, questions of success and longevity may arise when considering the investment you are thinking of making. There are literally thousands of different dental implant brands available in dentistry. All of these have gone through many changes over the years. Dr Anand has decided to put his faith into the Ankylos brand implant from Germany. This implant is one of the oldest brand that has seen 25yrs in production and success without any changes in its design. Dental implants have been in mainstream dentistry for about 30 years. The person who received the world’s first dental implant recently passed away after having had the implant in the mouth survive for 50 years. It would be wishful thinking to assume all dental implants will last that long or that it will last forever. Nothing lasts forever if you are going to use it 7days a week, every month year after year. Implants from the early days of dentistry are now ageing. Therefore, we are now finding problems with them that we still don’t have solutions to. The most common problem with dental implants is not the implant but rather the false teeth that are placed over the implants. Implants settle in and become rock solid with the bone, they don’t have any give or flex like the natural teeth. It is not uncommon to find the ceramics as the crown chip as the restoration ages. It is very likely over the service time of the implant prosthesis, there may arise situations where the teeth may need to be replaced due to wear or chipping or fracture. The odd component may need replacing or additional surgery may be required to service and maintain your investment. Regardless of how expensive a car or watch to a house you buy, everything needs regular service and maintenance so there can be some ongoing cost associated. In most cases, the cost is almost none and in some cases, the cost can be significant depending on the situation. Don’t expect your implant to stand there smiling away if you allow the rest of the mouth to fall apart. Of course, the implant crown does not decay but if your gums give up to periodontitis or change in health status, the bone around the implant will also suffer and hence problems arise. Peri-implantitis is a big problem with a lot of common implant brands. Peri-implantitis is the equivalent of the gum disease around natural teeth but much harder to treat and in some cases, lead to total destruction of bone around the implant and hence failure of some dental implants. Dental implants, if they are to fail, will potentially fail very early in the treatment. This often happens even before the prosthesis is placed or there may be slowly progressive bone loss around the implant, which can take years before presenting as a problem. On the other hand, when they work, they work so well that nothing beats them. Fortunately, a high percentage of Ankylos implants are working really well even after having been on the mouth for 20 years. Are you going to be the lucky one? Or are your implants going to last you your whole life, we don’t know because we don’t know how long you will live, we don’t know if you will live a strong healthy life forever or will die very sick with compromised immune system. So, there is no guarantee on how long the implant will last. Right now given the little or all that we know about dentistry, dental implants seem to hold one of the highest success rates of all the dental therapies available. Those people who have benefitted from these therapies absolutely swear by them. There are also those that have suffered a lot by way of failures as they seek the ultimate solution to tooth replacement. So, what guarantee does Extreme Dentistry give on implants? Extreme Dentistry gives you a guarantee that should an implant fail either in the early stage, during healing, during treatment or up to one whole year from the day implant treatment was finished, we will redo the whole procedure at no additional cost. Thereafter between one and two years, if any servicing is required, the cost to the patient will be half of what is normally charged. Between 2.5 years, the cost will be ¾ of what is normally charged. This will only be valid if the patient returns for 6 monthly check up and maintenance of his/her teeth so any potential problems with the implant can be quickly dealt with before they become big problems. Are you ready to book your dental implants procedure? Book online or contact the team at Extreme Dentistry on (08) 8948 1225.